Having the urge to scratch your scalp constantly is not only annoying, it’s distracting to those around you. An itchy scalp could mean several things: scalp eczema or dandruff among other conditions. To know for sure, you’ll want to visit a dermatologist. This sticky substance wasn’t just made for your afternoon tea. It can be used in countless ways - including treating your scalp eczema. 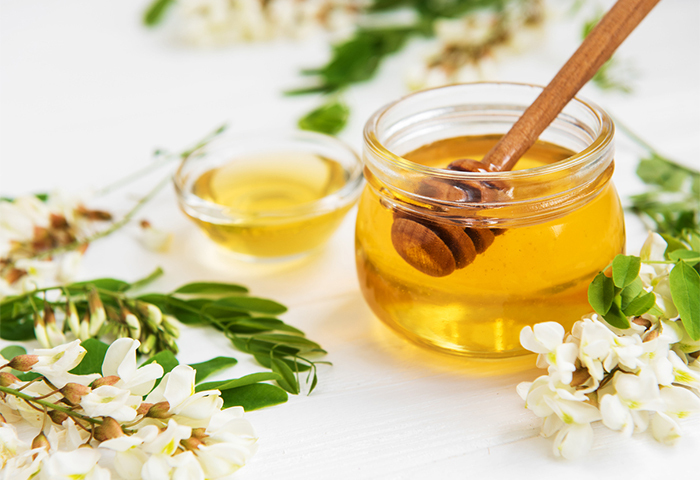 Honey has extremely powerful healing properties that fight bacteria and soothes the scalp. You may think honey on your hair sounds like a nightmare, but when mixed with the right ingredients, its results can make up for its texture. Simply mix 85 percent honey with 10 percent water and 5 percent olive oil. Apply the mixture directly to your scalp and let it sit for 2-3 hours while you wear a plastic cap. Rinse as normal. If you’re on the go and don’t have time to deal with water-based treatments, you’ll want to get familiar with healing oils. Rosehip seed oil is a very light oil, but it can handle the power of an essential oil when mixed. It also helps repair damaged hair follicles. Tea Tree Oil is pretty well known for its antifungal properties. Ready to combine these? Mix 4 parts rosehip seed oil with one part tea tree oil and use a dropper to apply to the area needed. Like honey, aloe vera can be used for practically anything. For those with scalp eczema, it can do wonders with constant use. All you need is a fresh aloe leaf, a knife and a blender. If fresh aloe leaf isn’t an option, you can buy bottled aloe vera, but nothing does the trick like the plant itself. If you want to get rid of inflammation, extract the gel from the plant by trimming off the sides and cutting off the green skin. This will leave the clear, sticky gel - the good stuff. See how to cut your plant here. Once it’s extracted, toss it into the blender and mix until smooth and froth forms at the top. Allow the froth the settle and you’re all done. After shampooing and conditioning, pour the juice onto your scalp. Let it sit for 1 hour and rinse. There is certainly a benefit to adding hot oil treatments to your hair regimen. Sure, they take a little extra time, but for those who suffer from scalp eczema, it can really make a difference. After cleansing your hair, apply warm coconut or jojoba oil directly to your scalp using a bottle with a nozzle tip. To warm the oil, place a mug filled with water into the microwave for 1 minute, then place the bottle into the mug to start the warming process. Once the oils and a plastic cap have been applied to the scalp, let the mixture sit for 30 minutes before rinsing. Coconut oil has great anti-fungal properties great for soothing an itchy scalp. Set yourself up for success by soothing your itchy scalp starting at wash day with tea rinsing. Tea rinsing can help combat shedding and promote a healthy scalp. Those like red tea, also known as Rooibos Tea can relieve symptoms of eczema due to its anti-inflammatory agents. To get started, brew a cup of warm tea and let it cool. Pour the tea into a bottle with a nozzle tip and apply it directly to your scalp after shampooing. Allow it to sit for a few minutes before rinsing and following up with your normal conditioner. What methods do you use to fight eczema on the scalp?